With two adult children and six more kiddos all the way down to a toddler, we still have a 100% dress up rate on All Saints’ Day. While that is not something I expect or demand, I admit that it really makes me happy to see it! 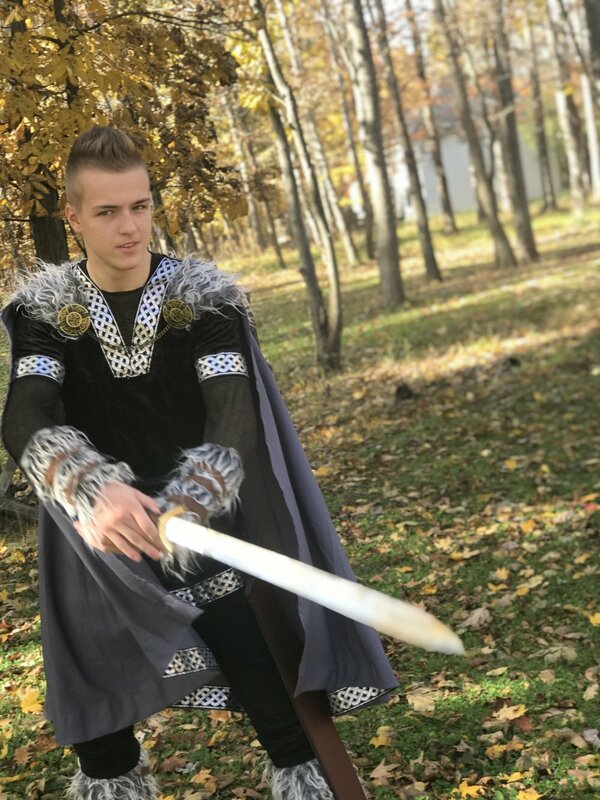 We also had participation from a couple additional young adults - who are dating our adult children - and my husband also found a costume this year (“I will invest once and wear this every year until I die.”) Scroll to the end to see that one. Ever since I accidentally threw out a decade’s worth of handmade costumes (yes, that was painful), I have been mixing it up in the interest of saving time and sanity. Half the fun for me now is finding budget friendly pre-made items that lend themselves to a little homemade tweaking. And I will do one new entirely handmade costume a year if needed. This is the only photo of him that I managed to take away from the celebration. He absolutely refused to wear his gear at the appropriate times so… we were able to catch him half dressed up through the glass door. He also refused to commit to a saint (“I’m a knight!”) so we just assigned him one and didn’t tell him. 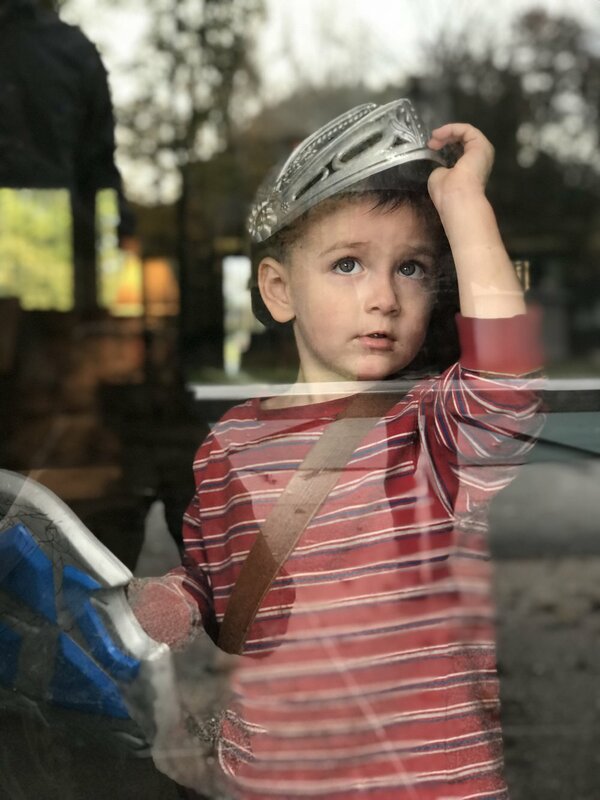 His helmet is from the timeless Full Armor of God playset which has been with us for at least 17 years. His shield is from a dollar bin at Walmart (with lots of pen marks). His heirloom quality leather sword and belt are from Made by Alejandro. She wore a toddler version of this a few years ago (link to come) but really wanted to do it again. Since she’s a pretty sensory sensitive kid, I knew that I had to make the costume soft enough for her to actually wear. It was a complete success. The crown looks scratchy but is actually made with very soft stretch lace as a base with the leaves individually stitched in one layer and a little glue gun action on top of that. The candles are felt with fake metallic flower pieces as flames. All leaves and flowers were dollar store purchases. I always have flower pieces and leaves around since they are surprisingly useful. We’ve used them to make hair clips, party decor, fairy dolls, packaging, and costumes. This dress though! It’s an Amazon purchase after a thorough search between Amazon’s and eBay’s dozens of Chinese distributors. I found it selling for anywhere from $70 to $15. It takes some creative searching and time but I scored the $15 price with a longer ship time. It is thin (layer accordingly) but so feminine and gorgeous. Our plan is to dye it a pastel color for Easter since it is just too pretty to be packed away in a costume box. He wanted to be St. Christopher and we made it happen using leftover oatmeal linen that we used last year for a St. Claire habit. Super easy stitches at the top and sides with a rough neckline and sleeves. Tied with a belt we just ripped along the grain and a quick traveler’s pouch. The cape was just a rectangle of heavy fabric we’ve had floating around for years. St. Christopher’s flowering staff started with a branch that big brother dried and sanded. They stained and varnished and I taped and hot glued a quick mish mash of paper bag and felt leaves. No glue touched the stick so they removed the tape and have a great walking stick or prop for future projects. They were one-size-fits-all and looked small-ish so I figured I needed the perfect age to make it work. I removed the pockets with my seam ripper and added snaps to the robe so that it would stay closed where we wanted it to. By the way, my Snap Setter is one of the best craft purchases I have ever made. Fifteen years of easy costume and garment closures! Highly recommended. I used extra pink satin that I have from my boutique baby blanket days on Etsy and I stitched the belt that came with the robe through the middle. More snaps to keep it in place. That left me with two rough tails hanging down the back which I just tucked in the top. It’s not really an authentic costume but if I squint eyes, I think it works. We found a skinny wood dowel in a craft box, broke it in half, painted it silver, and… done. Then we dug into our hair flower stash to complete the hair. She chose St. Catherine because she was struck by the parallels between what was going on at St. Catherine’s time and what is happening in the Church today. She was moved by the words and actions of the saint and felt that they spoke profoundly to the need of the laity to be bolder in their defense of Jesus Christ and the Church. 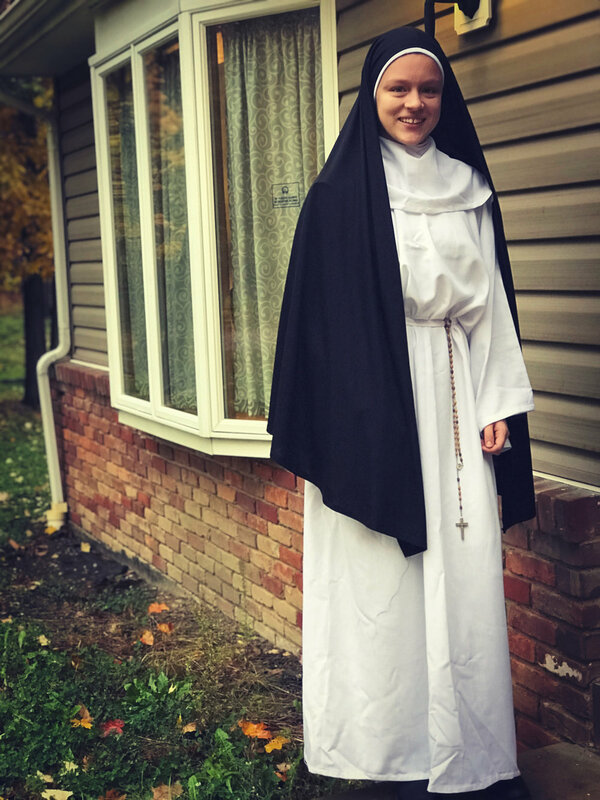 I thought she might like to wear a more flowery costume this year but she asked if we could resurrect her St. Claire habit from last year and modify it to be Dominican. How could I say no? I confess that it was an extremely last minute undertaking and I was shaking at the thought of having to stand in the pre-Halloween lines at Joann Fabrics. So I didn’t. Instead, I found an old black dress that I haven’t worn in years and I stole the skirt from it (ie chopped it off) to make the veil. A few stitches to hem and a couple snaps at the back of the neck and… we have a Dominican. 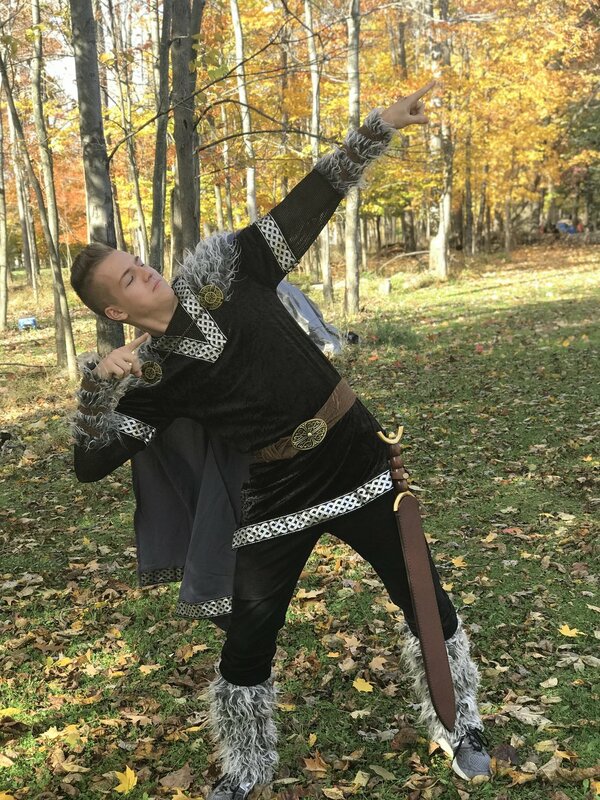 He invested his own money in this Viking costume several years ago and it is still going strong. A bit smaller than it used to be but no big deal. Sometimes a splurge is worth it. Especially for a mom who doesn’t have to put a single stitch or glue squirt on any of it. He did upgrade his sword this year and I admit that it was pretty cool and suited to the costume. Find it HERE. I’ll just call this pic “Keeping the Saints Culturally Relevant” but I can’t figure out if St. Olaf would love it or hate it. Or maybe he had his own noble version. She dug up some uncut faux suede fabric from our stash (likely used for a Kateri in years past) and threw together a quick dress layered over a maxi skirt. Then she added hair flowers which just seem so suited to an affectionate remembrance of the Lily of the Mohawks. Our oldest two children are both dating practicing Catholics who happily participated in the events. It was truly a joy. I wasn’t able to get a photo of the other two (St. Thomas Aquinas and St. Cecilia) but here is St. Maximillian Kolbe with Kateri. 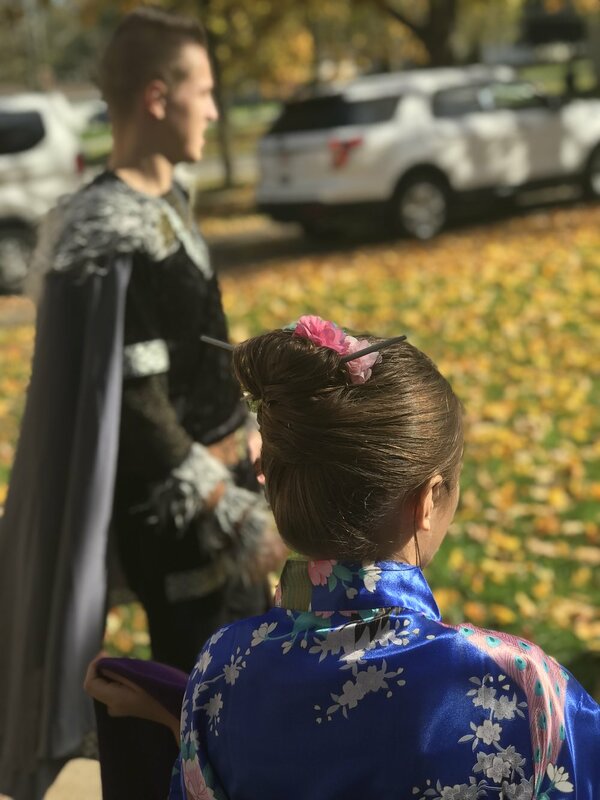 I did not dress up as anyone but my children pointed out that I could have pulled off a modernized version of a Chinese saint. I can see their point and this Floral Tunic Dress did ship from China so… maybe next year I’ll come better prepared. Honestly, shopping from Chinese shops on Amazon is super hit or miss (and we only occasionally purchase there) but this dress was actually quality construction with a soft but heavier rayon fabric. I don’t mean the fabric is heavy, just that it’s not too thin and not see through like many overseas products. My boots are Teva’s Foxy Midcalf Boot in black leather. It’s been a while since I purchased though so I’m only finding them in different colors or bootie options. Still cute with a rugged sole for icy winters. Hopefully I can start filling in tutorial links soon. Look for St. Lucy toddler and big girl version to come first!